A pleasure to use. Innovative Dynamic Phase mode. Six non-contiguous bands. Expansion as well as compression. Excellent sidechain options. Works well as a single-band plugin. The effects processors required to do it first found their place in the mastering studio, embraced by engineers for their ability to apply effective dynamics control to selected frequency areas of finished stereo mixes. As a consequence, most multiband compressor plugins are designed with the mastering stage in mind and, due to the multiple stages of processing involved, have tended to be very demanding on CPU resources and/or not as sonically flexible as they could be. Despite this, many mix engineers and sound designers have found the raw audio sculpting power of the multiband compressor to be invaluable, putting up with its mastering-orientated design and workflow in order to take advantage of it. 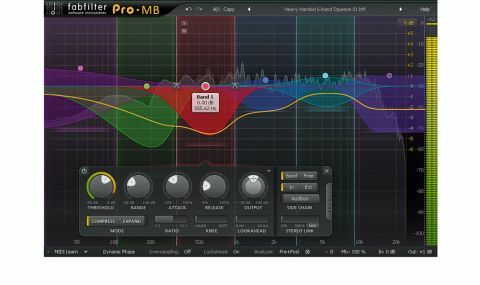 "FabFilter Pro-MB aims to bring multiband compression out of the mastering studio and into every stage of the production process"
Enter the much-anticipated FabFilter Pro-MB (VST/AU/RTAS/AAX), which aims to bring multiband compression out of the mastering studio and into every stage of the production process, without nailing your CPU to the wall, sporting the cleanest, clearest interface we've ever seen in such a plugin. In typical FabFilter style, the "top level" is quite bare, but there are plenty of controls tucked away beneath it, ready to be called up with a click when required. The first thing you'll notice when you push an audio signal through Pro-MB is the spectrum analyser in the background of the GUI. The speed and resolution of its analysis are adjustable, and we found it to have a significantly faster response than the analyser in FabFilter's Pro-Q, which Pro-MB's interface obviously has a lot in common with. Pro-MB can utilise up to six bands, and clicking anywhere in the main window creates the first of them, calling up a bank of familiar dynamics controls with which to set it up: threshold, ratio, attack, release, etc. The frequency range that this first band works on is indicated by its tinted background and dotted- line crossovers, which can be freely dragged left and right. When you click in empty space to create a second band, you'll notice that, unlike conventional multiband compressors, the bands don't have to be adjacent. In other words, they don't share boundaries/crossovers by default, although you can drag them together to merge them, and click the scissors icon that appears on the crossover when moused over to split adjacent ones. This is a significant innovation as with any other multiband compressor, you'd have to use a third band as a separator if you wanted the other two to work on non- contiguous areas. Or, to put it another way: replicating Pro-MB's six non-contiguous band processing (including adjustable high and low extremes on the outer two) on a typical multiband compressor would require the use of 12 crossovers. "The sound of Pro-MB is amazingly transparent, especially in the default Dynamic Phase mode"
While dragging a crossover left and right sets its cutoff frequency, dragging up and down on the filter icon in the middle of it sets the cutoff slope anywhere from 6-48dB/ octave. With each band having two borders, this allows them to be bent into asymmetrical shapes. Dragging the Range handle in a band, meanwhile, sets its maximum gain reduction. The whole system is exceptionally intuitive and quick, enhancing the plugin's suitability for mixing and creative purposes as well as mastering jobs. The sound of Pro-MB is amazingly transparent, especially in the default Dynamic Phase mode. As well as compression, each band can be switched to Expand mode, for adding punch to specific ranges by boosting (or reducing) the signal when it exceeds (or drops below) the threshold. The compression and expansion algorithms seem to have been very well fine-tuned, enabling you to jump straight in and get good results within a minute or so on most sources. Of course, it's possible to use Pro-MB as a single-band compressor or expander, too, in which case it's comparable but not identical to Pro-C from the same series - Pro-C is the more feature-rich (albeit single- band) plugin, generally, but Pro-MB has a variable knee control while Pro-C only has two fixed knee shapes. It seems like Pro-MB may well have it all: innovation, ease of use and a surprisingly low impact on the host computer's resources. It also features dithering and oversampling for when used as a mastering tool, as well as the option to specify the sidechain detector frequency range for each band, regardless of the range it actually operates on, helping with intricate mixing tasks. The geekier producer will absolutely love it, and thanks to its accessible interface and the sheer range of applications it can turn its hand to, we'd wholeheartedly recommend it to anyone after a more sophisticated process for those occasions when regular EQ and/or compression fall short.